BEIJING, July 30 (Xinhua) -- As permanent members of the United Nations Security Council, China and Britain should strongly uphold multilateralism, as well as the free trade regime and WTO rules, Chinese State Councilor and Foreign Minister Wang Yi said Monday. 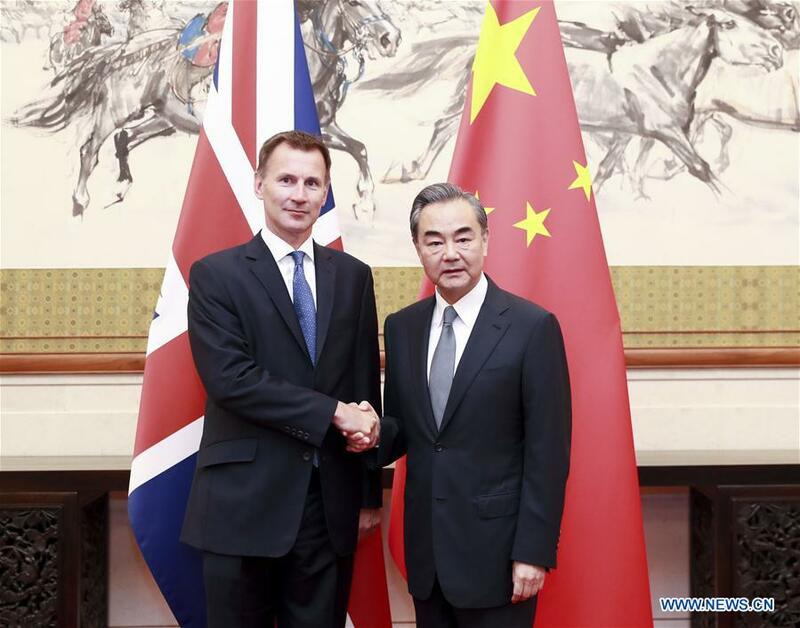 Wang made the remarks when co-chairing the Ninth China-UK Strategic Dialogue with British Foreign Secretary Jeremy Hunt in Beijing. Noting China-British relations have maintained steady growth momentum in recent years, Wang welcomed Britain to participate more ambitiously in international cooperation under the Belt and Road Initiative, in areas such as nuclear power, finance and innovation, and in new industries including artificial intelligence, green energy, and the digital economy. "China and Britain should treat each other's development as an opportunity instead of a threat," Wang said, "Under the current situation, China and Britain, both permanent members of the UN Security Council, should uphold their responsibilities and obligations to firmly maintain multilateralism, the free trade regime, and WTO rules, as well as opposing unilateralism and trade protectionism." The two sides should also seek political settlements for global and regional hotspot issues, cooperate to promote the common prosperity on the Eurasia continent, improve global governance system, and work for the building of a new type of international relations and a community with a shared future for humanity. Hunt said Britain appreciates China's achievements in poverty reduction as well as economic and social rights. Britain is willing to strengthen strategic dialogue and deepen exchanges and cooperation with China in various areas to boost the development of the "Golden Era" of bilateral relations, Hunt said, adding his country stands ready to deepen communication with China to jointly address various challenges, and safeguard multilateralism and global order.